Welcome to the 1911 World Series! The Phillies are out of it, but I’ve still got World Series fever. Therefore, I thought we’d relive the World Series of 100 years ago. I’ll be writing everyday as Hap Jackson, sports reporter for the Philadelphia Bulletin. I got the idea from this site, which started with a bang but shut down a few months ago. I thought it was a noble pursuit and thought I’d keep it going here for the Series. So expect plenty of photos, facts and bios of the 1911 A’s here in the next couple of weeks, written as if the Series were taking place now. (October 14th, 1911) NEW YORK– Hello, sports fans and welcome to the 1911 World Series, which begins at 2 p.m. today between the Philadelphia A’s and the New York Giants. This is a highly anticipated matchup, as the two teams took their pennants with little drama. The Giants won by 7 1/2 games, and the A’s looked like a Model T among horse and buggies on the junior circuit, winning by 13 games. There is no question that we are witnessing the two finest battalions in baseball. Let’s look at their starting lineups and see if we can find who has the upper hand. We’ll start with managers. 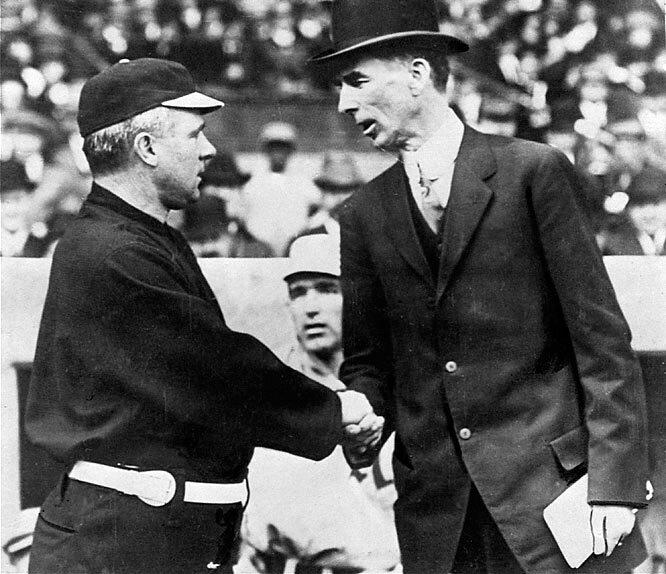 MANAGER: Very different styles in manager here, the quiet gentleman Connie Mack of the Athletics (in suit) and the tempestuous firebrand John McGraw (in jersey), aka “The Little Napoleon”. Both are effective in their own styles, and quite popular with their men. Mack takes a laid back approach, while McGraw is known for tripping baserunners when the umpire isn’t looking and barking at opposing players to throw off their concentration. Each man will surely send their troops into battle well-prepared. ADVANTAGE: None. These are two of the finest managers in the game. Despite contrasting styles, they have the full and complete respect of their players and are both expert tacticians. For A’s and Giants pitching matchups, click here. For Infield comparisons between the two teams, click here. For Outfield comparisons, click here.